This is a fun seasonal activity for Christmas that can be used a variety of ways. There are several versions of this in color or blackline download. 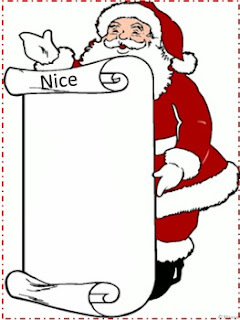 One has the words “Santa’s List” at the top, one “Nice,” one “Naughty” and the last is blank. Children can write down things they have done to get them on the Nice List and the Naughty List! It helps to give them an understanding of good behavior and not as good behavior. Plus, motivate positive behavior to add to the Nice List that will last long after Christmas! Children can write down what they want for Christmas right on the scroll! The list can be mailed to Santa after coloring. Follow Me to receive customized email updates about my store discounts, free activities and product launches.Look for the green star near the top of any page in my store and click it to become a follower.